I’m taking the CPA Exam today. What is the best time to drink coffee? There’s an algorithm for that. Can the U.S. Army help you pass your CPA Exam? Surprisingly enough, yes! According to an article from the Wall Street Journal, the U.S. Army has worked with the Department of Defense to develop an algorithm to determine exactly how much coffee one should drink—and when—to be the most alert and high-functioning. Actually, Dr. Reifman, yes! We could use exactly four hours of sharper thinking. That’s how long testing is on the CPA Exam! The algorithm says a drowsy person should consume 200 mg of caffeine when they wake up, and 200 mg of caffeine four hours later to produce the best possible results. If your exam is at noon, drink your first cup of coffee at 7:30 and your second at 11:30, right before you step into the Prometric testing center. According to the WSJ, 8 ounces of weak coffee has around 100 mg of caffeine in it, while a strong cup has 175 mg. Be careful, though! Drink too much coffee and you may need a bathroom break in the middle of your exam, and that will eat into precious testing minutes. For that reason, why not get your caffeine intake by drinking espresso? Less liquid, still heavily caffeinated. 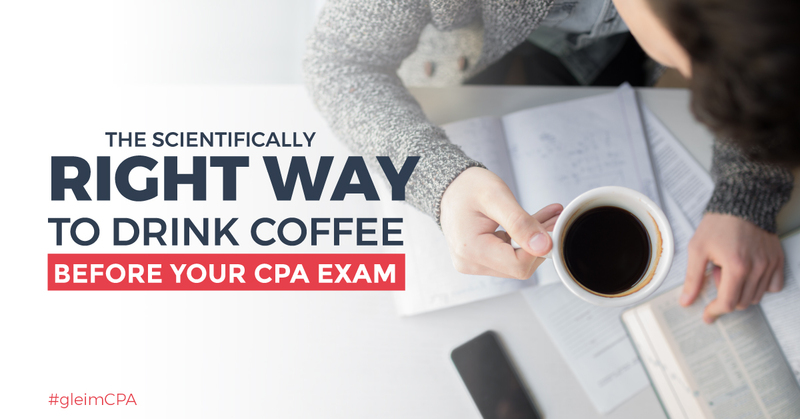 If you find yourself studying for the CPA Exam late into the night, take note of this little tip, because it will make work the next day much more bearable. If, against all of our advice, you don’t get enough sleep before you actually sit for the Exam, make sure to space out your coffee as close to the schedule above as possible so you can perform at optimal levels when you’re in the Prometric testing center. The algorithm isn’t public yet, but check out this WSJ article for more information about it. And keep in mind, this was designed for soldiers who are sleep deprived over a period of days. You may be tired, but you’re probably not that tired. Make sure to assess how coffee will affect you before your testing day, especially if you are not usually a coffee drinker or you are not accustomed to drinking more than a cup or two a day. Despite this exciting news, the most important factor in your success is still how prepared you are to tackle the CPA Exam content. Gleim will prepare you much better than any other review provider, and not even a good cup of coffee can bridge that gap. Demo our Premium CPA Review Course for free today.